As the Big freeze begins to thaw and we pop our heads up to have a look around 2010, the selection of band-friendly social media tools is growing. Say sionara to sporadic MySpace updates and incomplete tour information on Facebook. There are now more options for sharing your music with fans and empowering them to share it with others. 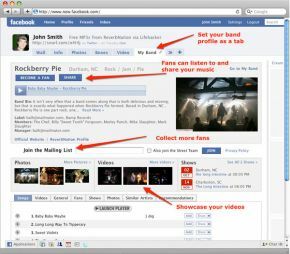 Since MySpace Music has failed to show much staying power, tools on other networking sites have risen to fill the void. Here are a trio of features, which encourage fan engagement and help you easily manage fan relationships reaady for this ever-changing new era of social networking. The Fan Page has revolutionized the way that bands can interact on Facebook, but Pages have always lacked the familiar look and feel of sites that are native to showcasing music. MyBand, on the other hand, lets you put your band’s photo, streaming tracks, and upcoming shows front and center. Set your preferences to show the MyBand tab by default, and suddenly people can get an instant snapshot of your band without scrolling or fumbling around. Introduced at the beginning of 2009, Twiturm lets bands upload music and share it through their Twitter profiles without sending listeners off to the depths of MySpace to access streaming music. By integrating with your band’s Twitter account, Twiturm allows you to post your music and track listens. You can also choose whether or not listeners can download the track. Additionally, users can share the track with their followers with one click. Acquiring new fans is only half of the battle. Maintaining your relationship with them is a crucial part of ensuring that they continue to engage with your band. This means taking a calculated approach to keeping in touch. Your fans may engage with you in only one place, such as e-mails or now in multiple places. FanBridge, a subscription service that was first introduced in 2007 and entered the black this year, aims to do just that by taking the guesswork out of e-mailing and texting fans. It even allows you to offer exclusive multimedia to those who sign up for your list. Service begins at around $7 per month and scales upward to about $250, a good deal for what is essentially a music-specific contact management system.